First cook the rice in a cooker separately and allow to cool. Then take a big deep bottom kadai, add oil and ghee together. When its becomes hot add seasoning to that. Wait a second and add cut onions to that, fry for 2 minutes till it change in colour. Then add tomatoes and chopped vegetables and mix well. If required add little water to that. Then add all dry masalas one by one. mix well. Close with a lid and cook in low flame. When it completely done remove from the gas. Wait for 5 minutes, and add the cooked rice to that and mix well. 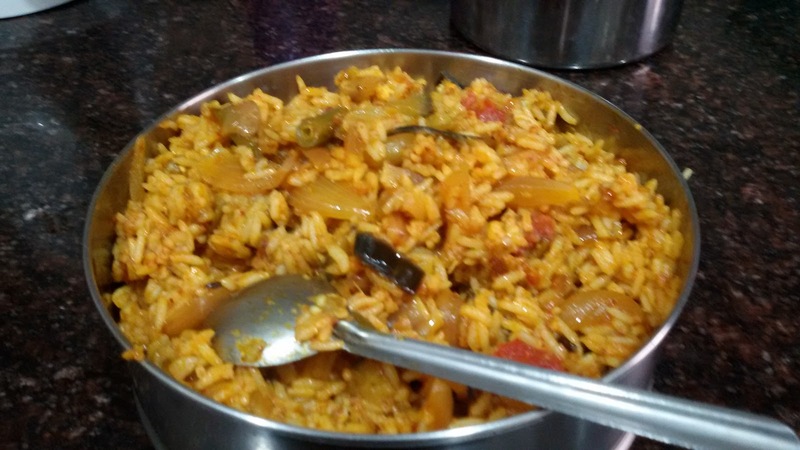 Your malvani masala rice ready to serve. Serve with raitha and roasted papad.